When you’ve been invited to a fun party right after work and there’s no time to go home and change, you’ve probably felt a little jealous of superheroes who always conveniently have their costumes on underneath their everyday wear. 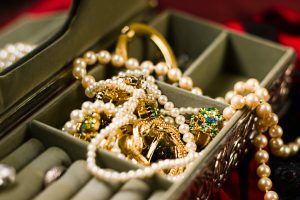 While there might not be an easy fix for your clothes, there definitely is for your jewelry. Look for convertible or multifunctional jewelry to add to your collection. They pull at least double-duty, and are perfect for women with busy, on-the-go lifestyles. There are two main categories of convertible jewelry: Jewelry that converts into other types or looks of jewelry, and jewelry that converts into functional pieces. Stay tuned to find out about both. Double clasp necklaces: Double clasp necklaces can be worn long and flowing. Or, if you need a shorter necklace to fit the neckline of your party dress, just use the double clasp to shorten the chain. Extender chain: These work in a similar way as double clasp necklaces do. However, to make a short necklace longer, you’ll use the extender chain that comes with it. Spire pendants: Spire pendants are easy to convert to suit your fashion preferences. No extra chains or double clasps are required. Simply grasp the chain by your neck, tuck the pendant through the loop, and leave it dangling—similar to how you would loosely tuck in a scarf. Alternatively, tie a loose knot in the chain a few inches above the pendant or just beneath your neck to let it hang differently. Another type of convertible jewelry can serve practical, everyday functions without compromising the beauty or refined look of the item. For instance, if you’re planning to meet up with friends for a few drinks after work on Friday, you could slip on the bottle opening ring by Objcts. It’s a gorgeously minimalist ring intended to fit the index finger of the dominant hand, and yes, it effortlessly slips off bottle caps without having to remove it from the finger. Prepare to amaze and astound your friends. Or, if you’re getting ready to do some traveling, slip on the Q Bracelet by Q Designs. It’s a chunky gold piece that complements many types of outfits well. It also charges your cellphone, which is ideal if you’re stuck in an airport and can’t find an available outlet for your regular charger. For tech geeks looking for some everyday wear, there are smart bracelets that sync up with a smartphone. Every time your phone receives a text message or other notification, the bracelet lights up and vibrates. Just remember to remove them before you get behind the wheel of a car—distracted driving is a major cause of fatal car accidents. For looks both whimsical and refined, you can turn to F. Silverman Jewelers in Bergen County, NJ. We carry the latest trending designs by top jewelry designers in the industry. Call us at 201.930.8883 or stop by our shop in Montvale. Ring in 2019 with a Brand New Jewelry Style!